Oh dear! Oh dear! I feel ill!!! But - I'm going to have a go now. What happens if everything stays grey on the screen, or won't it? Icey wrote: Oh dear! Oh dear! I feel ill!!! But - I'm going to have a go now. What happens if everything stays grey on the screen, or won't it? The Snipping Tool is extremely forgiving - perhaps to a fault. Mistakes can be made - even though only three steps are involved - but it's nearly impossible to cause irrevocable damage. If something goes wrong with your snipping, a vast majority of the times the program will simply close. There is no way to correct a snipping that has been misplaced. You must start over again in that case. You will always see your snip before you save it, so that you can simply toss it if you don't like it. But again, you must start over in order to get another snipping. I recommend that you give it a practice snip or two. It doesn't matter what you capture. Just use the tool to see how it works. You will be shown what you did right after that gray screen. If you like it, save it - it will ask you where you want to save it. I generally save it to the desktop and move it later to permanent storage if necessary. Once the screenshot is saved, you must then follow the normal image posting routine by uploading it to a server on the Internet and referring to that link with our [ img ] tags. The hardest part is typing the word "snip" into the search box. Right! Phew .... all went well until it came to the saving bit. I could either "save as" or just save, I think! Save to where? I couldn't see how to. How do I post it on here? I have to say that the instructions were fine up to that point Yogi - just as you said! I know I haven't quite managed it yet, but I'm not far off. I feel quite pleased with myself .... up to as far as I got. I think you beat me to the post Yogi. It's the saving bit that I can't see where to click onto. CLICK the usual (floppy disk) icon to save your work. Windows will suggest a directory, probably the /Pictures directory on your computer, but you can navigate to anywhere you like to save your work. 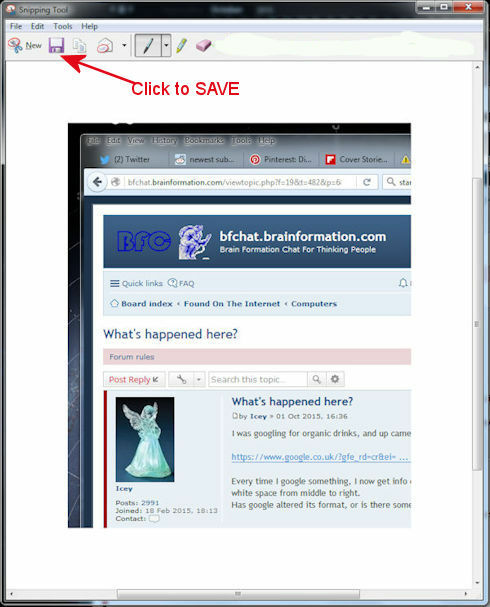 Once you save the screenshot to your computer, you will then have an image like any other image you have posted to our forums previously. Instructions on how to post images in our forums are here in our archive: http://neo.brainformation.com/viewtopic.php?f=10&t=1348 This is something you have done previously and should not be a problem. I will copy the instructions to this forum for convenience sake. I can't imagine what you mean. Can you post a screenshot of it? Seriously, I don't know what you mean. Exactly where is that line? It was the line which I drew with the cursor thing, but I've made a new screenshot now, and saved it to desktop. It appears to be OK. Phew. Then had to get into the old NBF, and couldn't remember my password - lol - but made a guess, got in, and see that you only describe how to send images. What I took a screen shot of, was my avatar and a post I'd made on here. OK, et me just go back and see if I can bring something up. Last edited by Icey on 05 Oct 2015, 16:22, edited 1 time in total. At this stage it's not important what you capture. You are just trying to become familiar with the steps. I copied the image posting instructions to this site and will update it a little later. Alas. I'm so near, and yet so far! I can do the actual screen- shotting (lol) now, and it's saved to my desktop, but when I opened it, it took me to my Windows Media Smart thing. There's no URL, so i can't copy that. How do I transfer it to over here Yogi? Publish the image in our forums using the [Img] BBCode. Could only put it here as a link though! OK., my brain REALLY hurts now. LOL! I'm off to bed, but ... thank you for what you've shown me so far. I'll be back. Oh dear me!!!! It's not right. LOL! What on earth am I doing wrong?